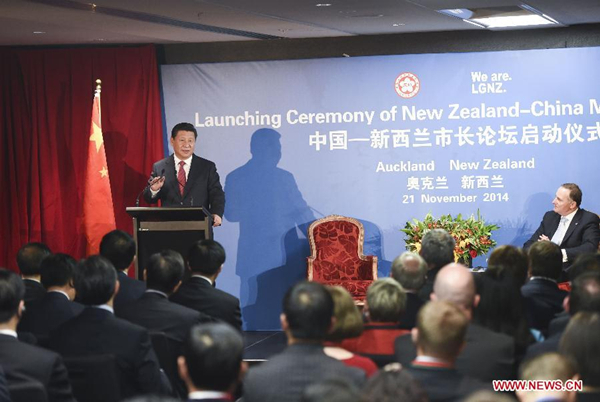 The formation of China-New Zealand comprehensive strategic partnership has "ushered our two countries into a new cooperative era," Chinese President Xi Jinping said at the launching ceremony of China-New Zealand Mayor Forum in Auckland on Friday. President Xi and New Zealand Prime Minister John Key attended the launching ceremony of the forum, a sideline event of Xi's state visit to the island country. The formation of China-New Zealand comprehensive strategic partnership has "ushered our two countries into a new cooperative era," Chinese President Xi Jinping told a forum in Auckland Friday.